Once upon a time, I decided to start a blog. After jumping into graduate school at Emerson College in Boston, I got the itch to start writing again and decided blogging would be a good way to get my feet wet. I had been married for a year and a half, my husband and I were thinking of buying a house, and, despite a blighted ovum missed miscarriage in May of 2013, we were trying to start a family. I got pregnant again in October and as Christmas drew closer, I figured my life was exciting enough to entertain, appeal to, or touch people: unemployed graduate student, pregnant again after a miscarriage, married to a specialist in the US Army National Guard, pursuing motherhood and a career in publishing. 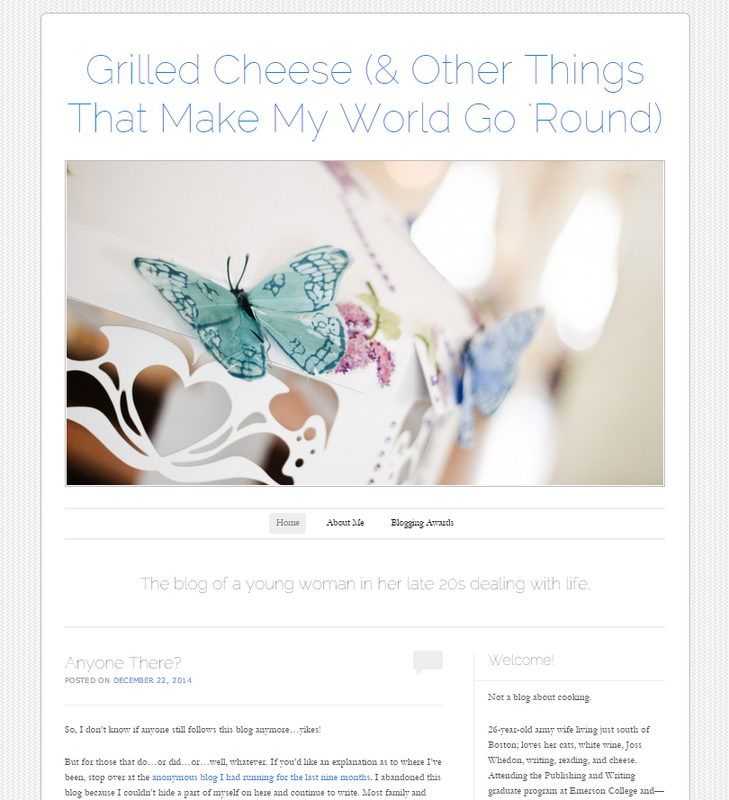 So, in January of 2014, I launched my blog: Grilled Cheese (& Other Things That Make My World Go ‘Round). Of course, by the time the blog was live, I had already found out that my second pregnancy had failed. Our baby’s heart stopped beating around 9 weeks, and at a little over 12 weeks a few days after Christmas, I had a dilation and evacuation (my second that year). Deeply buried in grief, anger, and uncertainty, I questioned whether or not I should even launch the blog…but I did. And for five or so months, I tried to keep at it. Even as I was secretly undergoing testing, procedures, and even surgery to fix my infertility and miscarriage issues. We began our first medicated cycle in April, just as my first year in graduate school drew to a close, and I found I could no longer write on Grilled Cheese. From April to June, I wrote only a handful of entries. I wasn’t being honest with my audience, so my heart wasn’t in it. Also, in April, another blog was receiving more of my attention: days before starting our first cycle, I started a new anonymous blog called When Dreams Become Rainbows. After three cycles, I became pregnant…and I remained on my anonymous blog, password-protecting pregnancy posts after my second beta to protect my infertility/miscarriage friends, up until the end of my second trimester. I decided a new blog was in order: the first blog had been long abandoned; the second blog seemed not necessarily “tainted,” but something similar, with everything I had gone through to get where I am now. 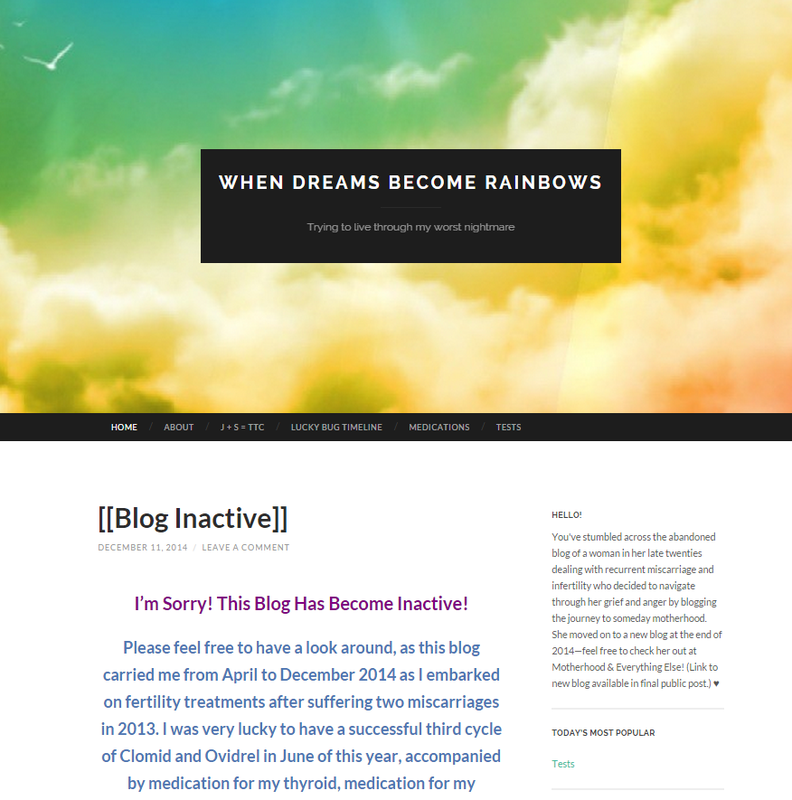 I wanted a fresh start, and I wanted to blend the two blogs together in some fashion. So here we are: this is the new blog, following me as I continue this journey that I meant to start over a year ago. Relatively new mama to my son, a new homeowner, eventually finishing graduate school, working in the publishing industry, still married (he’s a sergeant now), and still everything that makes me who I am! I still love chocolate, wine, Joss Whedon, cats, and a whole bunch of other stuff. In fact, you can read this post from the Blogging 101 course I took in January in which I detail a little more about what you can expect from this blog. I am me. I will write honestly—sometimes too honestly—with passion, with humor, with sadness, with sarcasm. I want to meet more bloggers, befriend more people, reach others with my own words and experience. Even after two years of blogging, I’m still a newbie. I still don’t know what I’m doing. All I know is I want to be here, in this world, with the rest of you, writing as we do. Your blog is so inspiring. I too have suffered miscarriages and am passionate about sharing honest stories and giving hope to others. I am building a website focused on sharing stories of pregnancy loss to parenthood to help bring hope to others. If you would be interested in writing your story to share on the site, please email me at alittlerayofsunshineinfo@gmail.com. I would be happy to also post a link to your blog at the end of the story. The site is alittlerayofsunshine.today. It is still in the editing stage, but feel free to browse around. Congratulations to you and thank you for offering a voice for this experience.